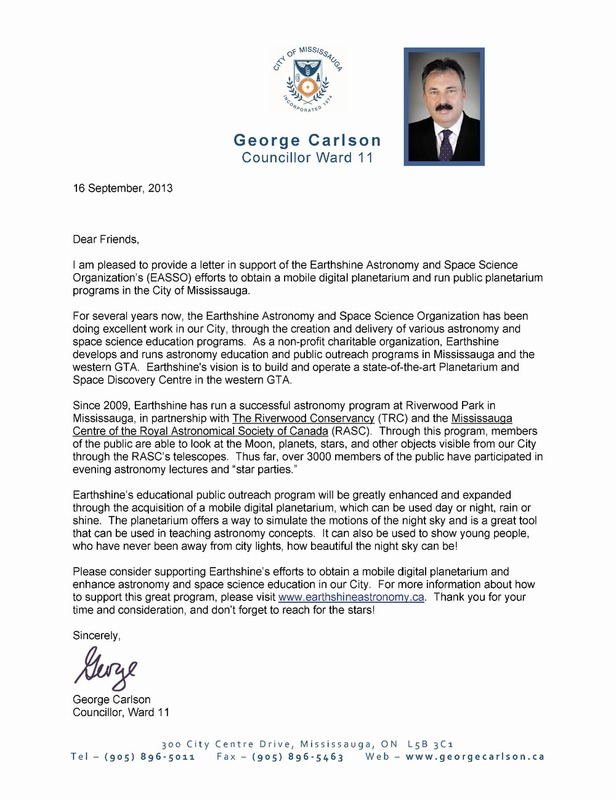 I am pleased to provide a letter in support of the Earthshine Astronomy and Space Science Organization's (EASSO) efforts to obtain a mobile digital planetarium and run public planetarium programs in the City of Mississauga. For several years now, the Earthshine Astronomy and Space Science Organization has been doing excellent work in our City, through the creation and delivery of various astronomy and space science education programs. As a non-profit charitable organization, Earthshine develops and runs astronomy education and public outreach programs in Mississauga and the western GTA. Earthshine's vision is to build and operate a state-of-the-art Planetarium and Space Discovery Centre in the western GTA. Since 2009, Earthshine has run a successful astronomy program at Riverwood Park in Mississauga, in partnership with The Riverwood Conservancy (TRC) and the Mississauga Centre of the Royal Astronomical Society of Canada (RASC). Through this program, members of the public are able to look at the Moon, planets, stars, and other objects visible from our City through the RASC's telescopes. Thus far, over 3000 members of the public have participated in evening astronomy lectures and "star parties." Earthshine's educational public outreach program will be greatly enhanced and expanded through the acquisition of a mobile digital planetarium, which can be used day or night, rain or shine. The planetarium offers a way to simulate the motions of the night sky and is a great tool that can be used in teaching astronomy concepts. It can also be used to show young people, who have never been away from city lights, how beautiful the night sky can be! Please consider supporting Earthshine's efforts to obtain a mobile digital planetarium and enhance astronomy and space science education in our City. For more information about how to support this great program, please visit vvvvw.earthshineastronomy.ca. Thank you for your time and consideration, and don't forget to reach for the stars!